Biblio Visual is the only visual classification system for children’s books that follows the Dewey Decimal System. It’s simple, illustrated and effective! The Biblio Visual classification system for children is available for schools and public libraries. We offer solutions that are tailor-made for your library. 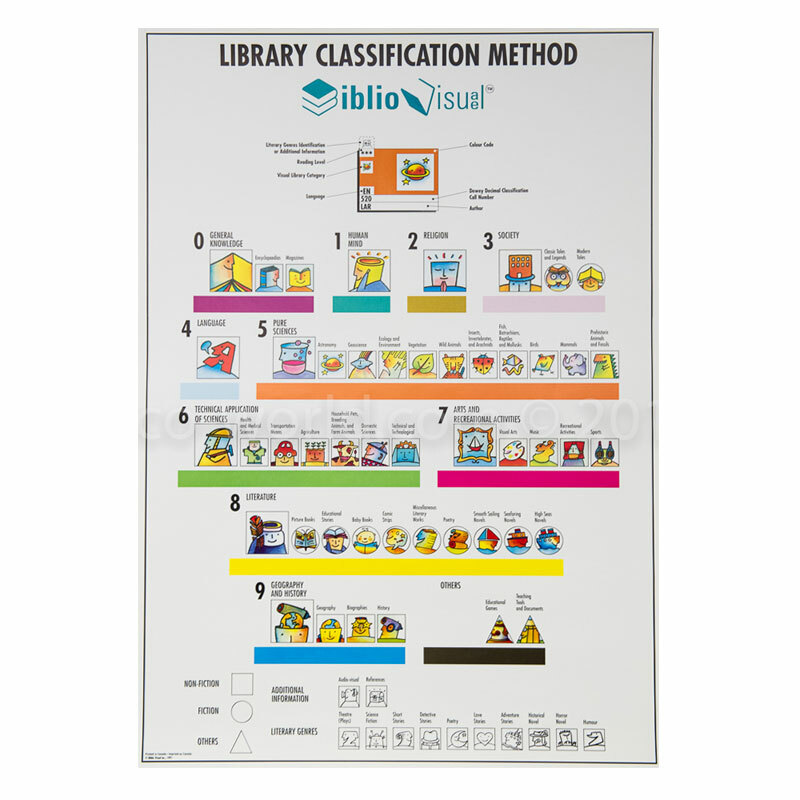 The Biblio Visual book classification method is made up of a series of signs, labels and stickers that illustrate clearly every class and division of the Dewey Decimal System, making it possible to organize children’s books visually, on library shelves. It consists of a set of signage tools for book classification, which serves as a helpful guide for children who are trying to locate books. Biblio Visual will also make the job easier for your library staff. In pairing our visual signage with the Dewey system you already have in place, you will attract even more visitors to your library thanks to our user-friendly search system. Keep it simple! Choose Biblio Visual. Biblio Visual, which follows Dewey Classification in an abbreviated form, uses a visual language based on pictures, colours and shapes. The quality of the illustrations, which we owe to Philippe Béha’s relaxed and amusing style, greatly adds to the charm of Biblio Visual’s materials. Simple cartoon-like drawings represent each of the general categories and divisions. These pictures are so easy to understand that children quickly come to think of them as universal symbols. The picture is repeated on each tool, from the large poster, which acts as a map of the library, to the book on the shelf, making the search for materials that much easier. Each general category is assigned a specific colour. The colour code becomes an important key in helping children find their way around the library. The use of colour also makes it easy to spot any books or other materials that have been shelved incorrectly. Each picture is placed in a square, circle or triangle. These geometric shapes provide additional information about the books and other materials in the various divisions. Promote the child’s autonomy while or she searches for a book. Create a more relaxed environment in your library. Make it a familiar, reassuring and infinitely more attractive place for children. Make it possible for them to have fun while searching for books and other materials, entirely on their own, guided by posters that illustrate a simplified Dewey system. Improve your quality of life at work. Make re-shelving books simpler and increase your productivity by using our effective tools. You’ll have more time to devote to other interesting projects. Have you ever spent hours, or even days, looking for a book that had been shelved in the wrong section of your library? Scanning sections is quicker and more effective when you use Biblio Visual’s colour illustrated tracking tools, so you avoid wasting time and energy on accidentally misplaced materials. Take advantage of our visual communication tools and encourage your young clientele to gain a better understanding of the Dewey Decimal System. Our simple and educational classification method is a real asset when training new employees and volunteers. Thanks to Biblio Visual’s highly effective classification system for children’s books, your library users will become more autonomous, and will no longer need you to walk them through all the steps. You’ll save time and energy and decrease your employees’ workload. You’ll also save money since you won’t need to hire staff to do monotonous tasks, and instead, you’ll have more to spend on interesting workshops and reading activities. Your clients will be more satisfied and you’ll be on your way to success! Our tools can be installed in the blink of an eye. * DEWEY DECIMAL CLASSIFICATION and DEWEY are trademarks, property of OCLC Online Computer Library Center Inc.